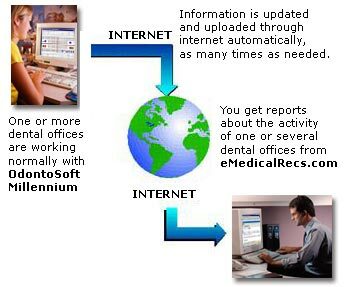 As you read your email from anywhere in the world, through a connection with eMedicalRecs.com, this modern feature of OdontoSoft Millennium will allow you to get online reports about most of the transactions in your dental office, dental clinic or dental office's network. You and your staff works normally with OdontoSoft Millennium, with NO internet connection, registering patient's treatments, payments and personal information, in a single dental office, a clinic or a dental office's network. Any time you need, as many times as you want, connecting to the Internet, a special program will upload the information that you wish (in 2 dates) automatically. From any computer in the world with internet access, you will get online reports by doctor, clinic, date, etc., through a password protected access. Of course, if you don't want this feature, you will be able to work with OdontoSoft Millennium perfectly. You have a single dentist office and you need to review some information from your home or another location, such as some patient's data or financial transactions of your dental office..
You have several dentists employed in one dental office. Some day you may need to verify clinical or financial transactions about one or more of them from outside the office. You have several independent dental offices or clinics, each one with its own doctors staff. Since each office has its own unique code, you will be able to see the activity of each office, doctor, group, etc. This feature will let you issue general or partial reports on one or all dental offices of your group. Does this service have some additional cost? Even when eMedicalRecs.com subscription has a monthly cost, this module purchase includes a free 3 months subscription. After this period, you will know if this feature is really useful for you and you will be able to extend your membership on a discounted monthly basis. This module is the only OdontoSoft's optional one. Is it difficult to use? A free demo account is available on eMedicalRecs.com and you will test all of its features. However, combined with OdontoSoft, its utilization will be even easier because the information is already entered into your computer. You just need to upload it to eMedicalRecs with a special program. Does anybody access to my information? Access to eMedicalRecs.com is password protected, so nobody will be able to access to your information. Can my information be lost? As in any program, you can make backup copies. In the website, we make daily backups..
Do I need a broadband connection? No. A regular dialup access is enough. Does my secretary or assistant need to know my eMedicalRecs.com password? No, once the program is setup, password is not required, thus website password will not be necessary. 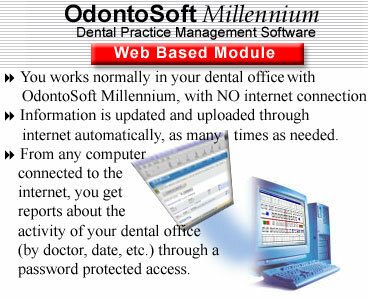 I would like to use OdontoSoft Millennium but I don't like this web based feature. What must I do? Just use OdontoSoft Millennium and don't buy this module. How is the setup process? Once you buy OdontoSoft Millennium, we will enable a new eMedialRecs.com account and we will send you the program for an automatic access to the site. I want to buy OdontoSoft Millennium. Please fill in this form and we will contact you shortly. I have still more questions, not explained here. Please, email us and we will be glad to answer them for you.